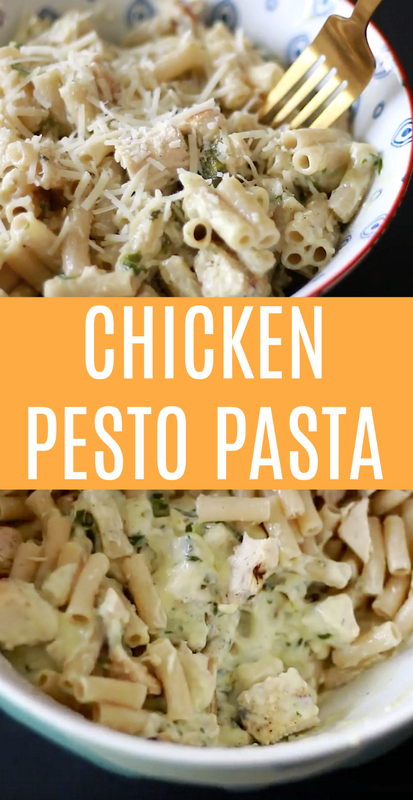 This Chicken Pesto Pasta Dish could not be any simpler and it is oh so yummy! 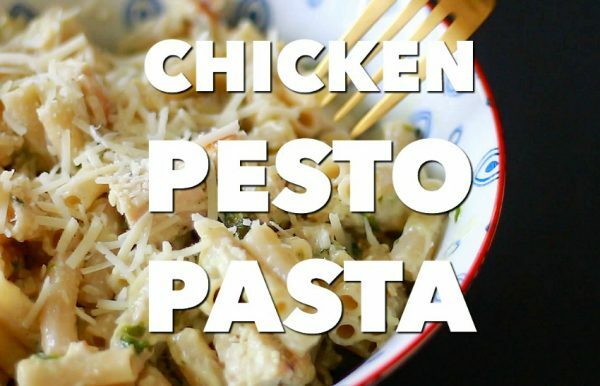 It has 3 of the best ingredients out there: chicken, pesto, and pasta. Oh wait, don’t forget the parmesan cheese!! This is a family favorite your crew is sure to love too. It whips up in a flash, you’ll have dinner ready in no time. Cook and prep your chicken and pasta to your liking and combine in a bowl. Set aside. For the sauce, bring your heavy cream to a boil, stirring constantly, it will come to a boil fast. Let this boil on medium heat for 4-5 minutes until it thickens up. Add your pesto and stir. Add your parmesan and stir until most of the cheese is melted in the sauce. Add your salt and pepper, not too much as the pesto and cheese have a lot of flavor by themselves. 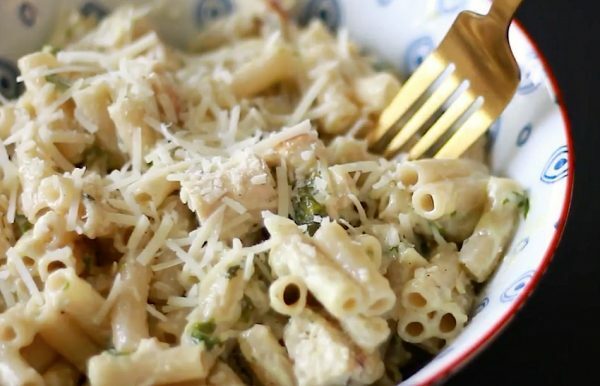 Pour your pesto cream sauce over the chicken and pasta, and stir to combine. Now it’s ready for dinner. See what I mean, soooooo easy! Just watch, you’ll be adding pesto to everything you make! And cream, and cheese! 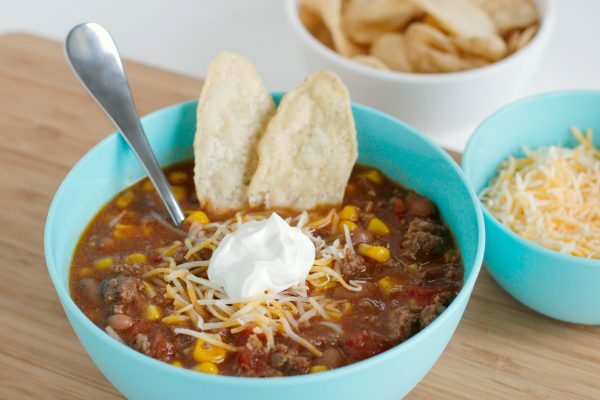 Easy Taco Soup for Dinner – Everyone in our family loves this recipe for taco soup. It’s great for big groups too, if you’re hosting another family. Pair with with some chips and sour cream for toppings. I love corn chips or tortilla chips. 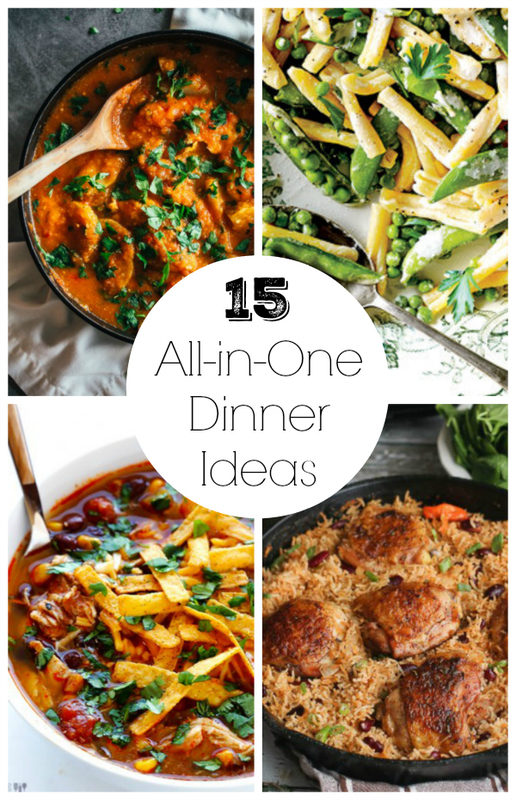 15 Delicious All-In-One Dinner Ideas – Deliciously simple all-in-one dinner ideas come in handy when you’re trying to feed a family. They are a one pot meal your whole family will love! 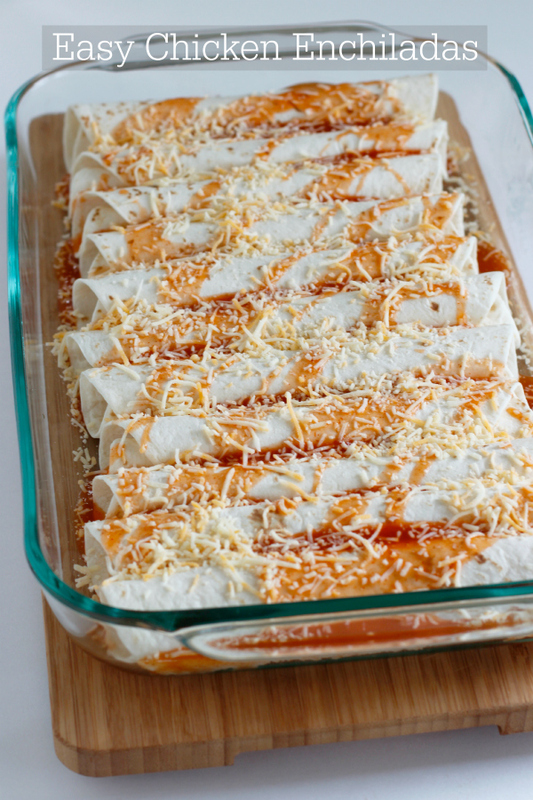 Easy Make-Ahead Chicken Enchiladas – We’ve been making these enchiladas for years! With only a few ingredients, you’ll have dinner ready in no time. 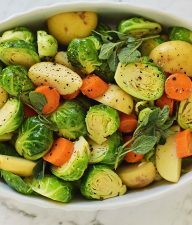 I will be making this tonight but, I will be adding Artichokes and sun dried tomatoes…Thank you for the easy recipe. I will be sharing this with my daughters and friends. Can I use whole milk instead of heavy cream? That’s all I have in the fridge and I don’t want to run to the store. I have a ton of shredded chicken that I cooked and want to use it up! BTW…my stand mixer is the biggest helper when it comes to shredding chicken! Sorry for what may be a stupid question from a stupid guy. Would this dish travel well? I want to bring this dish to friends after I make it. I told them I would bring lunch and now I am stressing out. They are an hour away. It looks so good and something I can actually do. I wasn’t sure because of the cream. Can I reheat it when I get there? What a nice friend you are. I wish someone would bring me some chicken pesto!! And to answer your question, yes. 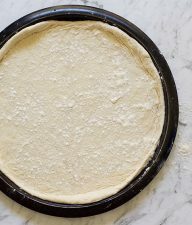 In fact, sometimes this dish is better the next day after it’s been cold and then reheated in the microwave, as the cream gets a little more buttery. I would suggest storing it in a cooler and then reheating. Maybe don’t mix the pesto with the chicken and pasta until you get to the house. Either way. I made this dish tonite and it was AMAZING! SO DELICIOUS!!! I will definitely be making this again. Instead of salt and pepper I used Garlic Salt and a bit of basil. YUMMMM! Thanks for the recipe!! We love, love, love this dish at our house too! 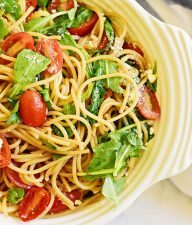 It is so quick and easy and I completely agree with the cherry tomato addition. This looks delicious! I can’t wait to try it tonight! I’m just wondering, how do you cook the chicken? Do you add anything to the chicken? There is no special way to cook it, just make sure it’s cooked. As you will add the pesto sauce, it doesn’t really need any special way to be prepared. I made this a few weeks ago and it was perfect! I am going to put it on my blog. Thank you for so many great recipes, crafts and ideas. Nicole – good question. A box of pasta is 1 pound, so half a box is half a pound. I usually cook the whole box, but my family can only eat half. So I save the other half for something else during the week! 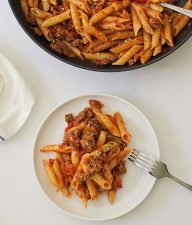 OR you could double this recipe and make it with the whole box of pasta. When you say 1/2 box of pasta, how much is that?! Thanks! Oh yes! That’s one of our favorites, too! Anna – Great idea to put in some asparagus, yum! And back to Rachel again – I tried your chicken breast, smothered in pesto, and rolled in chopped pine nuts. SOOOOO good, and so easy! Thanks! I made this last night and it was GREAT! Thanks so much for a delicious and easy meal. I made some asparagus to go with it. I am also working on the paper corsages! Thanks again! Yum! That looks awesome, Marie! Yum! Another easy and yummy pesto type sauce is here http://kitchenparade.com/2006/01/winter-pesto-with-pasta.php . I use this recipe all the time. We love to make Grilled chicken and tomato pizza with it as the sauce. I love pesto. I love pasta. And I love chicken. Pesto sauce is easy to make and it does not cost much. Most of all, pesto sauce is healthy. This is a very timely entry, as I just happen to have a jar of pesto, fresh parmesan, AND (even Kroger brand) whipping cream. Thanks! I just bought the same jar of pesto! Dang Costco samples got me! But, now I can’t wait to make this dish. On my way to my pantry to see what I need for dinner this evening. Rachel – I LOVE the idea for pesto and chicken breasts and pecans! Or even crushed pine nuts! Thanks for sharing. YUMMY that looks so good! thanks for the recipe! Salina – Yes, tomatoes. Those would be a great addition, giving it a pop of color! I make this and it’s AWESOME!!! Try adding cherry tomatoes and fresh mozzerella, you won’t be sorry.